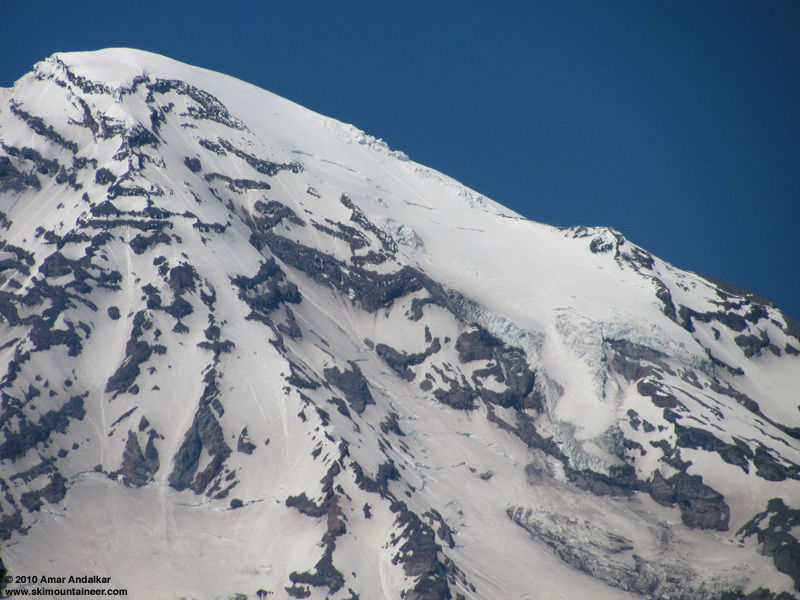 Summary: Skinned from 4th Crossing Trail to Camp Muir via Paradise Glacier on Sunday evening, and then soloed the Disappointment Cleaver on foot the next morning. 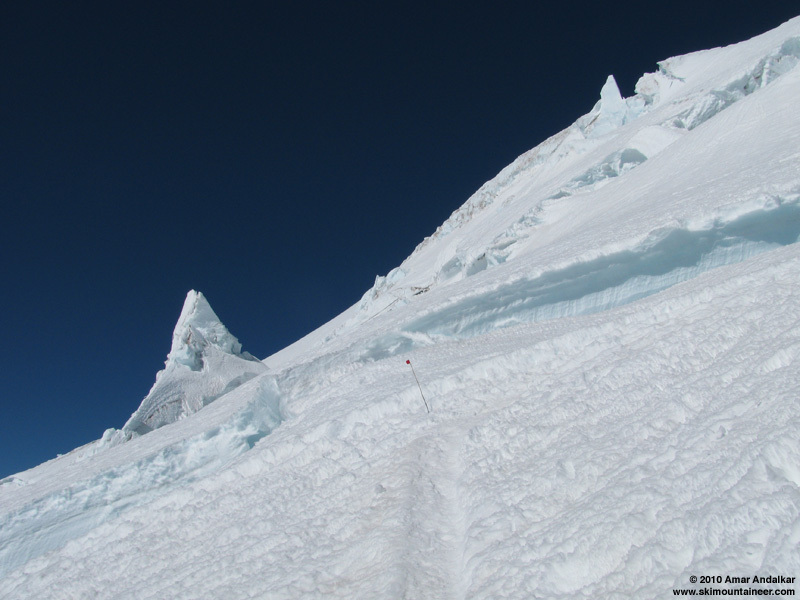 The DC is in excellent shape with a smooth bootpack trench extending from Muir to the summit, and minimal crevasse issues or rockfall as of yet. Skied from the summit at 11:30am and down the Kautz Glacier in complete solitude, then dropped through the crux Kautz Ice Chute just after noon, following numerous ski tracks from the previous days. Fairly smooth snow and even corned up on the upper Kautz face from 14000 ft down to about 12500 ft, fun steep skiing in a grand setting. But then heavily suncupped and very poor skiing conditions through the Chute and below to the exit traverse at 11200 ft. A dirty surface of suncups growing rapidly into nieve penitentes 1-2 ft high, very challenging to ski with jump turns often needed, and the smoother whiter surface of previous ski tracks providing the only relief. I definitely hit this route several days too late. 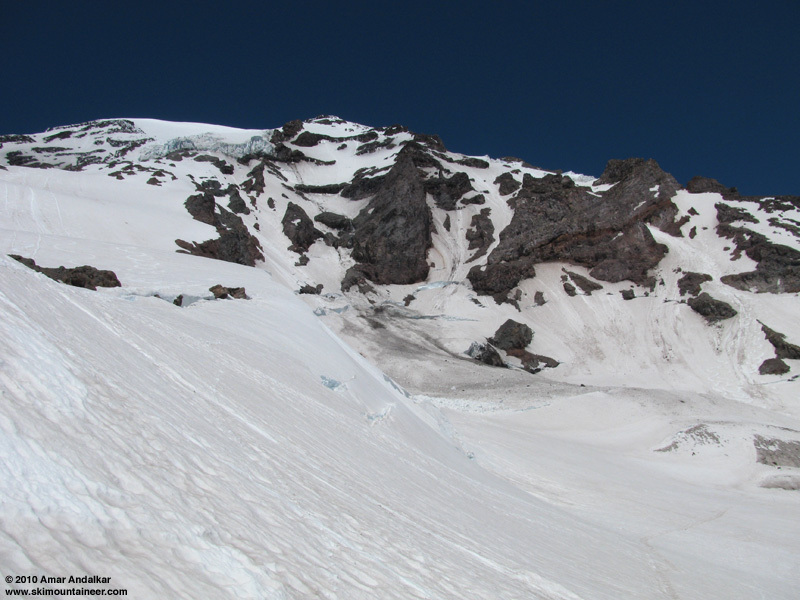 The Kautz is totally done as a "nice" ski route for the year, although since the Chute is not yet showing bare glacial ice, it may remain skiable for several more days (or longer) for those desiring a stunningly scenic ski descent in challenging conditions. Crevasses are opening rapidly above the Kautz Chute, with several long sagging dips crossing the slope, but are not yet a problem on skis. 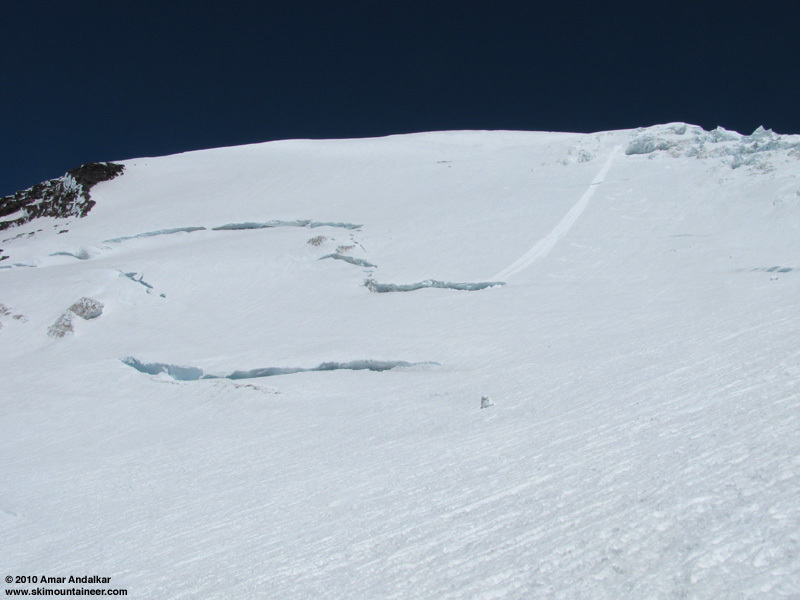 The Turtle Snowfield is also done as a worthwhile ski objective of its own, the surface is dirty and heavily suncupped from its top end down to 10000 ft, eventually improving to smoother snow below that and onto the Wilson Glacier, with nice skiing on well-consolidated corn. Still a great trip despite the long section of challenging snow, with beautiful sunny weather and a 9000+ ft ski descent down a majestic route in very rare summer condition, skiing from the summit to within yards of my car. Not bad for mid-July! Looking back up the Kautz Ice Chute from the exit traverse at 11200 ft. Details: I wasn't actually planning to ski the Kautz this time . 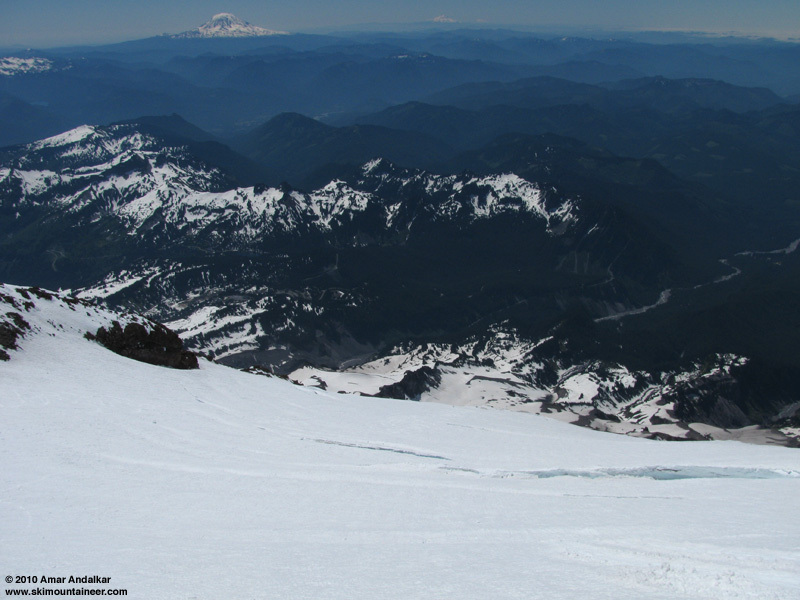 . . One of my main ski mountaineering goals for this spring (and really, since 1999) has been a ski descent of the Tahoma Glacier, the tremendous ice stream flowing westward from Rainier's summit dome. Hopefully approached and exited entirely on skis, via a traverse from Paradise along the circumnavigation route. Weather had foiled plans for an attempt the previous weekend (July 10-11), as we headed south for Adams and Hood instead. My Friday ski trip (July 16, 2010, Paradise Glacier and Muir from 4th Crossing) was really a scouting trip for the Tahoma Glacier, with the main goal for the day being to get high-res photos of the glacier in the late afternoon to see if the route still goes, after all the continuing warm weather and 14000+ ft freezing levels. The best road-accessible viewpoint with a closeup view of Tahoma Glacier is on FR 59 (Copper Creek Road) off SR 706 just west of Copper Creek Inn, about 7 miles of gravel logging road through forest to reach a stunning 4500 ft vista looking straight at the glacier. Unfortunately, it looked somewhat broken up with a potential bergschrund issue near 13000 ft, but I was prepared to make the approach and give the climb a shot to see if the ski route would still go. 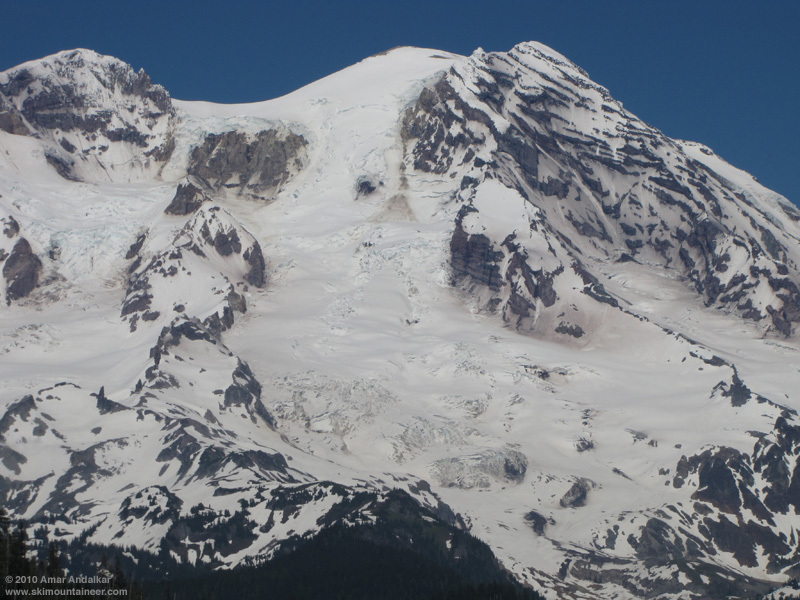 Despite a great forecast for this weekend, I couldn't find any partners willing to give it a shot, and the Tahoma Glacier is not a route that I wish to solo. So what to do on a beautiful sunny weekend? How about the Kautz Glacier, which vague anecdotal reports indicated was in "great" shape for skiing. I'd skied the route with partners in 2008 via a carryover from the DC, in excellent snow conditions (see TR), and felt quite comfortable soloing it that way this time. I'd also gotten high-res zoomed photos of the Kautz Glacier on Friday (similar to the first photo above), and the route looked good from the road. Huge numbers of ice worms on the Paradise Glacier near 8000 ft. Pulled into Muir at 7pm, just after the camp went into the shadow of the Mountain for the evening, but still almost 2 hours until sunset. Being Sunday night, crowds had thinned a bit versus the weekend, and it was easy to find a few free spots in the public shelter. Spent the evening chatting with numerous climbers and a lone skier at the hut, and enjoying a fine sunset above the sea of clouds. 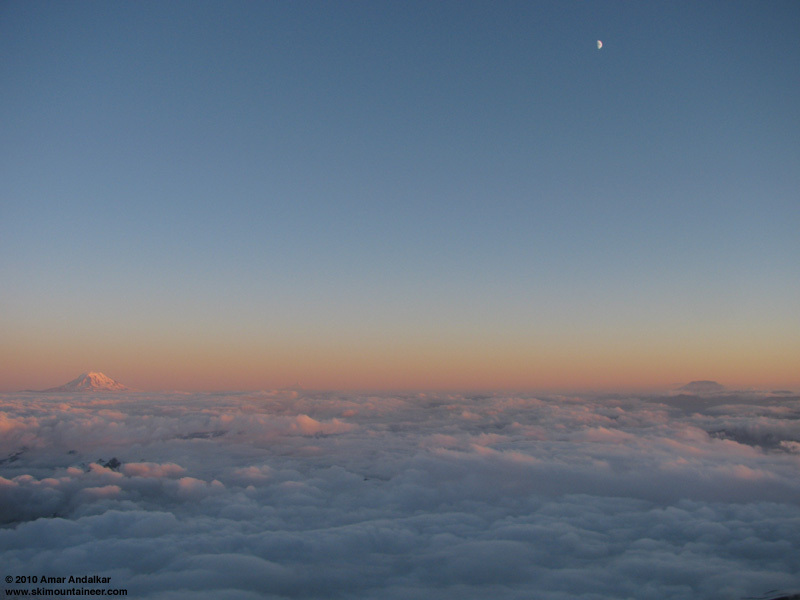 Sunset and a quarter moon above the sea of clouds, with Mounts Adams, Hood, and Saint Helens in the distance. Set the alarm for 5am, to enjoy a leisurely breakfast and a gorgeous sunrise. I did not plan to ski off the top until around noon and hoped to make the ascent in under 5 hours, so I had plenty of time to relax. 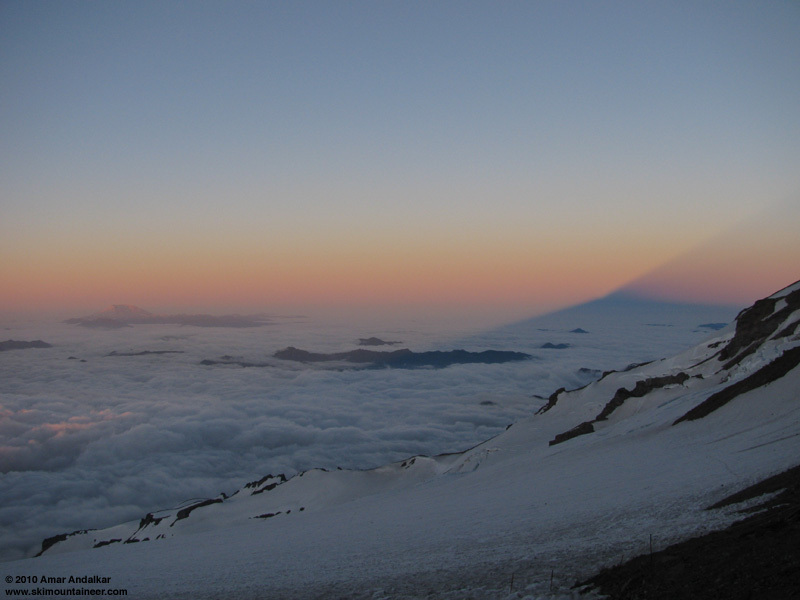 Sunrise and the triangular shadow of the Mountain. Headed out from Muir at 6:30am, on foot with crampons, wearing a helmet and harness just in case, and carrying all my overnight gear since I would not be returning this way. A breezy NW wind kept things chilly at times, despite the intense morning sun. A smooth bootpack trench made for easy and fast travel, and the snow outside the bootpack was well-consolidated and firm too, making it easy to pass the dozens of descending parties without having to stop and wait. The DC route is currently on snow almost the entire way, over 95% snow, except about 200 vert at Cathedral Gap near 10500 ft and another 200 vert in a few short pieces along the nose of the Cleaver near 11400 ft. 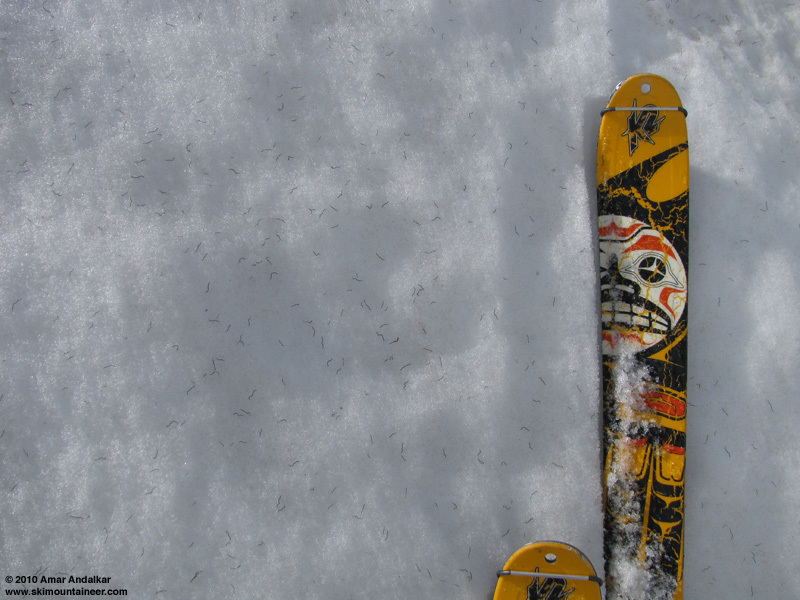 There were several recent ski tracks descending the Cleaver (from the weekend? ), dropping through a higher gap onto the Ingraham Glacier near 11600 ft and traversing above a large open crevasse, rather than staying on the partially-bare nose of the Cleaver. The DC is still a viable ski route, although the snow is becoming rough and suncupped in many areas, and it's certainly many days past its prime. I was the only person with skis on the entire route this day, though. Seracs near the bootpack, around 12600 ft just above the DC. Topped out on the summit just before 11am, with a gusty 15-30 mph NW wind making things quite chilly. But luckily NW is one of the easiest wind directions to shelter oneself from at the summit, and dropping 10 ft down the SE side of the rim reduced it to a gentle breeze, quite comfy in the warm sunshine and temps near 30 �F. 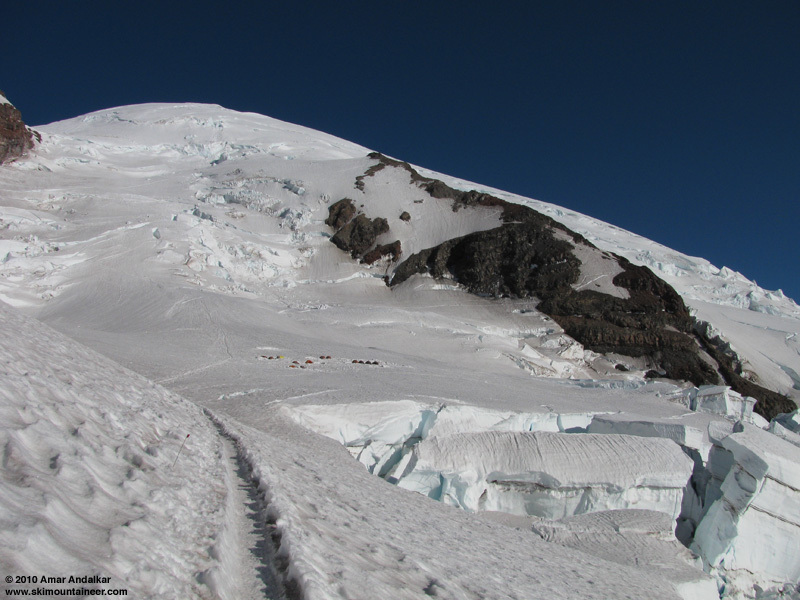 The guided throngs had long departed, and it was deserted up there except for a family of four who had come up the Emmons, the survivors from a group of 11 who had left Camp Schurman near midnight. On the crater rim, just south of Columbia Crest, with the west crater and Liberty Cap behind. 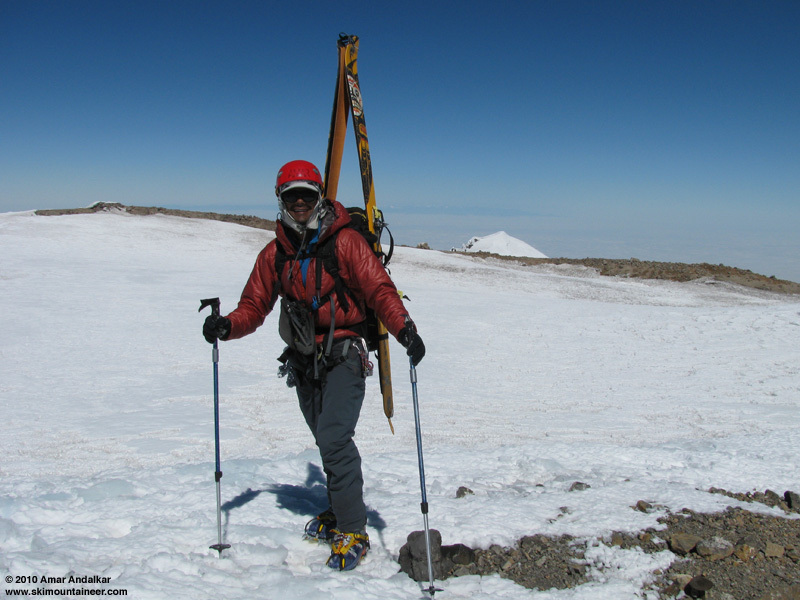 Skied from Columbia Crest at 11:30am and through the west crater, then down its south face to the Point Success saddle. Mostly firm frozen sastrugi in the crater, softening slightly on the steeper 30-degree south face, not very good but hardly awful either. Then skating across the saddle and dropping onto the upper Kautz Glacier face near 14000 ft, the slope suddenly going from flat to 40+ degrees, and the snow from frozen to nearly corn. Still a bit firm, perhaps I should have waited until noon or later as planned, but quickly softening enough for nice turns on the steep face. Even here, the snow is becoming heavily textured by the sun, and bothersome suncups are probably only days away. There were no other parties on the route today, only complete solitude in the vast open bowl, suspended in the sky above distant rollovers dropping over unseen cliffs. Looking down the upper Kautz Glacier into the valleys far below, with Mounts Adams and Hood in the distance. Enjoyed some nice big turns on the untracked face, angling leftward to avoid the large open bergschrund I had seen from below on previous days. Soon the fun was over though, as the bowl flattened and the snow surface roughened near 12500 ft. Most of the previous Kautz skiers had followed the normal climber's route, which angles NE from the Chute to cross the top of Wapowety Cleaver near 13000 ft, and so I reached their tracks just as the snow worsened. Thankful for that, as the smoother whiter snow of the tracks allowed easy passage through the nastiest sections of suncups and penitentes. Looking back at the upper Kautz face from near 13000 ft, with my ski track and a runnel from a falling block of ice. The ski tracks all angled into the Chute from the right, then it looked like several had sideslipped the steepest portion, about 200 vert at near 50 degrees. Firm almost-icy snow on this crux, but thankfully groomed flat by the tracks, making for reasonable turns -- this section would have been much nastier without the grooming. Looking down the Kautz Ice Chute from the rollover at its lip, with the exit traverse visible below. Then continued nasty penitentes, 1-2 ft high, along the exit traverse to the notch at 11200 ft. This notch, which normally has a 20-30 ft climb up a fixed line on very loose rock above a large drop-off, had almost entirely filled with snow this year. Unfortunately, it had melted off for a few feet in the recent warmth, forcing me to remove the skis and carry them up around an exposed corner and up about 4 ft of bare ground. It was only a few yards to reach continuous snow on the other side at the edge of the Turtle. The exit notch at 11200 ft, with the fixed lines mostly buried in snow. More suncups and dirty grey-brown snow on the Turtle Snowfield, quite a disappointment, but at least it was very well softened in the afternoon sunshine and easily skiable even if not very fun. I soon passed an IMG guided party of 12, roped-up and headed for camp near the notch, planning a Kautz ascent the next day. Snow conditions improved gradually near and below 10000 ft, becoming smoother and cleaner, with nice skiing on well-consolidated corn. 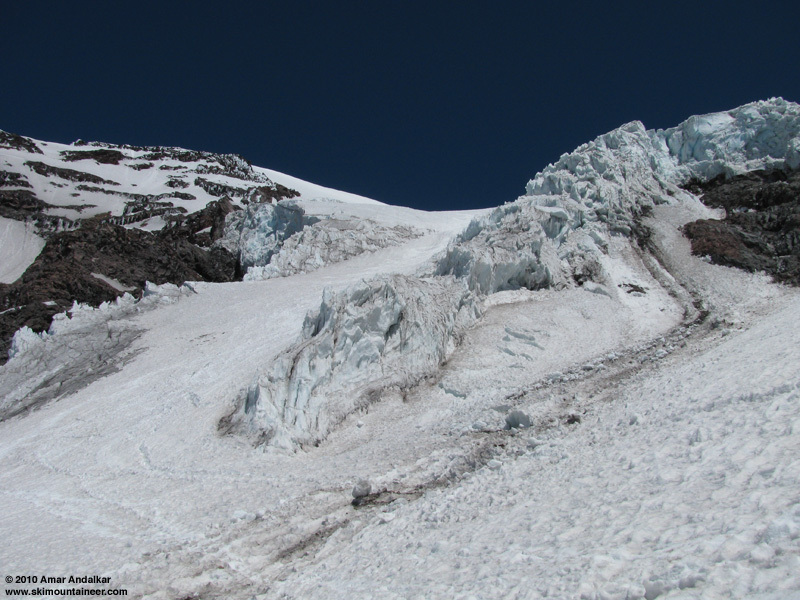 The edge of Wilson Glacier near 9500 ft is blocked by a large open crevasse, but a quick detour of a few hundred yards to the west around a rock island allows an easy connection on continuous snow. The Wilson skied OK, much better and more consolidated than my last trip here 3 weeks ago (June 25-26, 2010, Fuhrer Finger), quite stable with none of the mushy wet slide hazard of that day. Looking back up at nice turns on the lower Turtle (left) from the edge of Wilson Glacier at 9500 ft. Lots of ski tracks at right in Fuhrer Finger too. A quick traverse across the Nisqually Glacier, with numerous thin cracks opening everywhere across the glacier, then a short hike of about 10 vertical ft up the bare moraine. The 200 vert skin back up to Glacier Vista was in blazing sunshine, but went quickly on a firm previous track not yet destroyed by boots. From Glacier Vista, careful routefinding was needed to ensure I could ski back to the 4th Crossing Trail. East across through the notch near 6250 ft, then a gentle downhill angling traverse around Edith Creek Basin, above another knob near 6100 ft, and then a downhill run beside a small creek brought me right to the Skyline Trail bridge across the Paradise River at 5500 ft. A quick shuffle across the bare bridge (snow reaching both ends though) and a quick schuss along the 4th Crossing trail brought me to my starting point just after 2:30pm, about 23 hours since I had left. 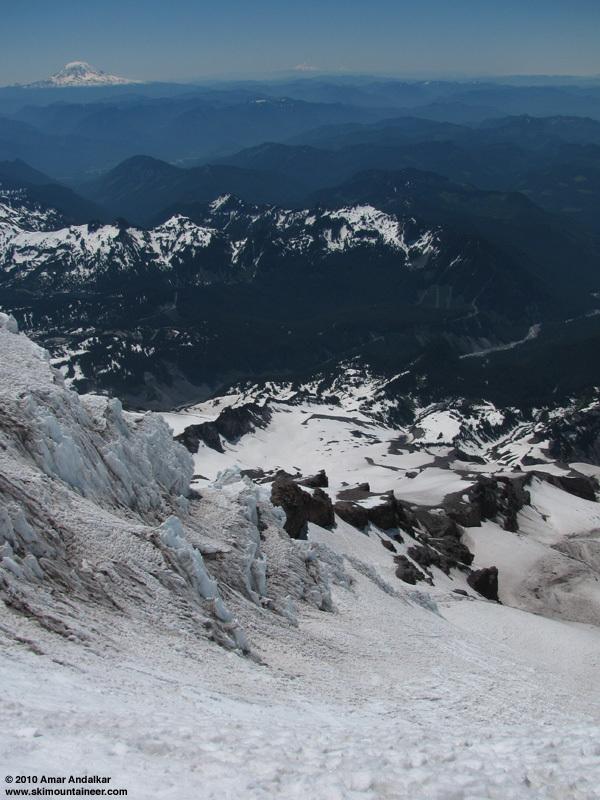 Looking back across Nisqually and Wilson Glaciers from Glacier Vista. Always so nice to enjoy a magnificent sunny day on the Mountain, despite a mixed bag of ski conditions ranging from sweet summerlike corn to much-too-summerlike suncups and penitentes. About 9400 ft of total gain for 9400 vert of skiing, still nearly continuous from the summit to the car in mid-July. 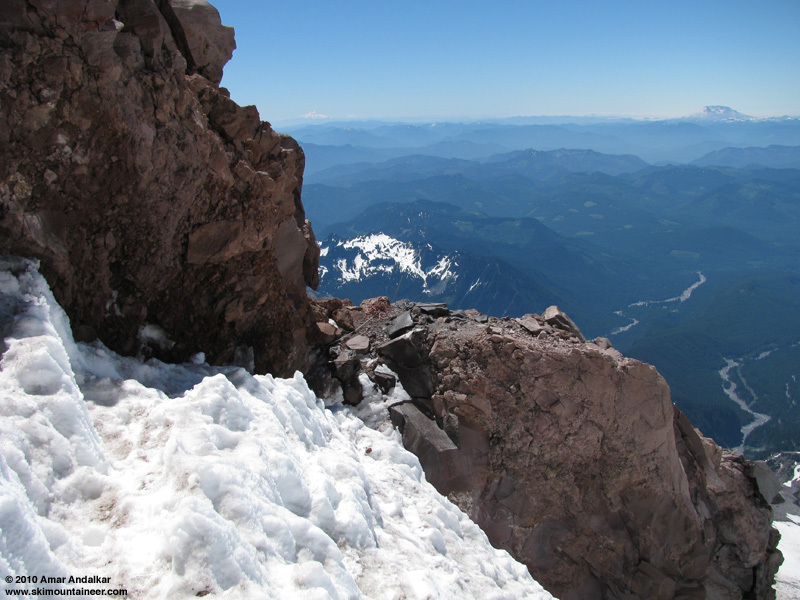 My 20th Rainier summit and 16th ski descent, including 4 ski descents in 2010 by 4 routes. I look forward to many more in the future, but I think that the season for ski descents from the summit has largely passed by for 2010. 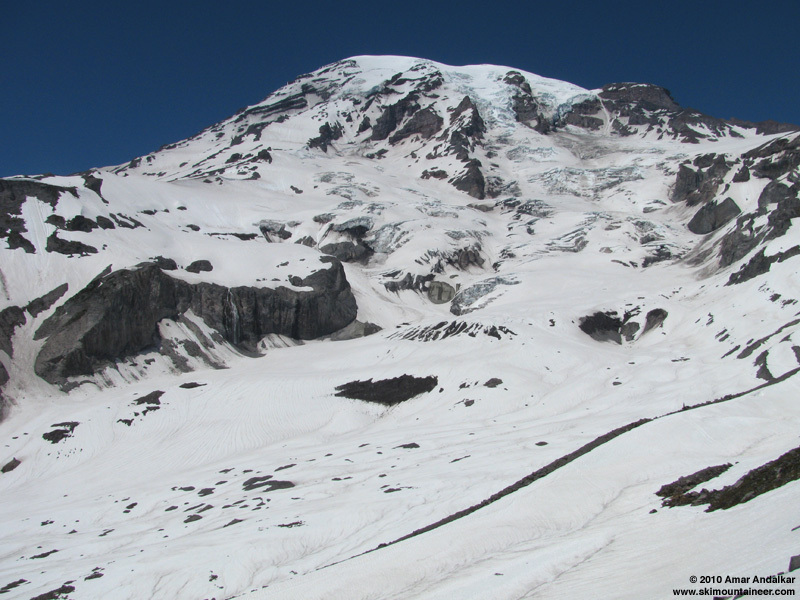 All routes are past their prime and rapidly getting worse, although several summit routes will remain skiable for the next few days, and perhaps even into early August. Snow coverage and surface conditions remain remarkably good on the mid-mountain from 6000-10000 ft though, which should ensure nice turns in August and even September in the usual midsummer spots. SYNOPSIS...A WEAK...LOW PRESSURE SYSTEM MOVING ACROSS THE REGION WILL RESULT IN MORE CLOUD COVER TODAY...ALONG WITH A CHANCE OF DRIZZLE OVER THE LOWER CASCADE SLOPES THIS MORNING. HIGHER PRESSURE ALOFT WILL RETURN ON MONDAY. THIS COMBINED WITH WEAKENING ONSHORE FLOW THROUGH TUESDAY WILL TRANSLATE TO WARMER AFTERNOON TEMPERATURES MONDAY AND TUESDAY. TODAY...PARTLY SUNNY. A CHANCE OF MORNING DRIZZLE OVER THE LOWER SLOPES. FREEZING LEVEL 12500 FEET. TONIGHT AND MONDAY...PARTLY CLOUDY. FREEZING LEVEL 13000 FEET. MONDAY NIGHT...MOSTLY CLEAR. FREEZING LEVEL 13000 FEET. TUESDAY...MOSTLY SUNNY. FREEZING LEVEL 12500 FEET. TUESDAY NIGHT...MOSTLY CLEAR. FREEZING LEVEL 12500 FEET. WEDNESDAY THROUGH THURSDAY...MOSTLY CLEAR. FREEZING LEVEL 12000 FEET. THURSDAY NIGHT...MOSTLY CLEAR. FREEZING LEVEL 13000 FEET. FRIDAY NIGHT...MOSTLY CLEAR. FREEZING LEVEL 13000 FEET. SATURDAY...MOSTLY SUNNY. FREEZING LEVEL 12500 FEET. Who put in the ski tracks just left of the big ridge/butress further to the left. Is that the East Success Couloir? That's a hell of a line.